Not sure how else to describe this version of our favorite hero, Link from The Legend of Zelda, other than uber. And awesome. 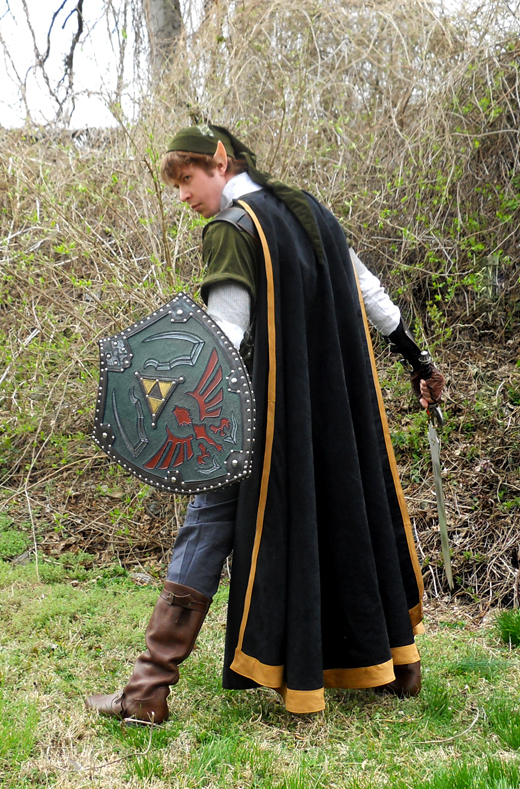 When I found this image a few years ago, I decided that I needed to have this costume, since I love dressing up as Link, and I had never seen anyone attempt a version like this. It was a very interesting take on Link, merging Twilight Princess Link and the Fierce Deity from Majora’s Mask. My first iteration of this costume matched the concept rather well. The tunic was made in a medium gray, with red and gold accents. I made a custom Hylian shield, done in silvers and gunsmoke, though I decided to leave the bird red to match the crimson highlights. (And now that Skyward Sword has been released, we know why there is a bird on the shield!). The pants were made in a darker grey, replacing the normal cream colored pants. While I loved this costume, all to often I was asked, “Are you Link?” And when I would reply yes, they would say “Awesome!” But from a costuming point of view, they should say awesome first, not have to ask if I am indeed a particular character. And so I began playing with taking this Uber Link concept, and making it my own. 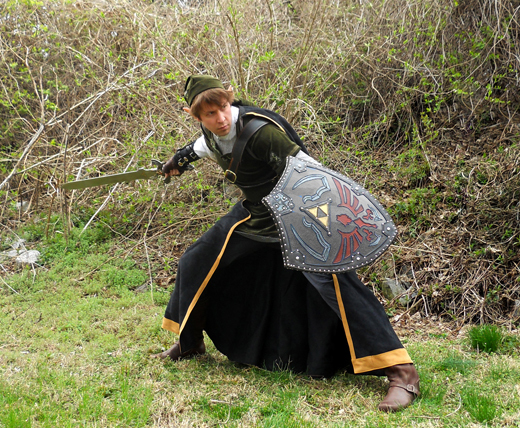 I decided to pair the darker tones of the concept Link with my standard Twilight Princess costume. I felt the traditional Link colors would be more recognizable, but with the darker pants, cloak, and war skirt, it would make people do a double take. 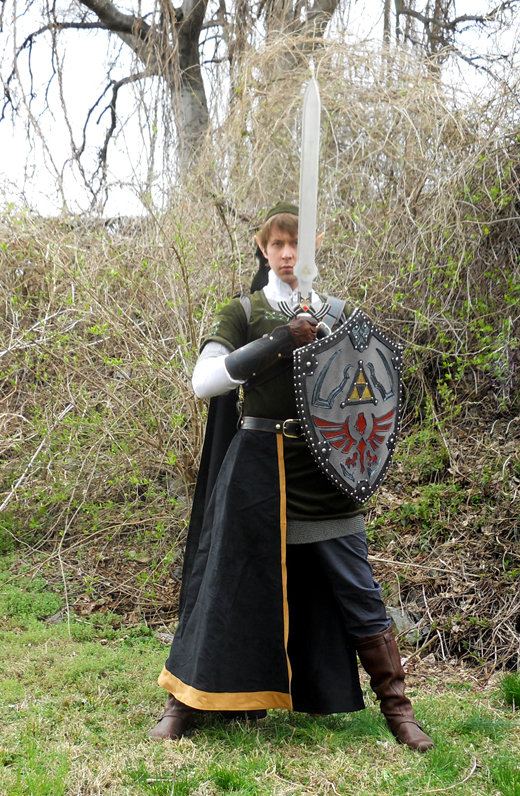 What I have learned is that Link with a cloak and war skirt = one bad mother… HEY listen! Sorry, I had to have that joke in here somewhere. All the leather belts and bracers are done in a dual tone, black with brown accents. Along the waist and shoulder belts, they are black in the center with brown strips along the edge. And the bracers are black with brown designs. All hardware, buckles, rivets, etc. are brass.